Bangkok is everything you'd expect from the capital of Thailand: it's noisy, crowded, colorful, exciting, infuriating, and smile inducing. There are ancient sites to be visited and modern shopping malls that have a kitschy yet high-end ambience. Bangkok can be overwhelming as its lifeforce smacks you in the face, but it's a fascinating city that represents Southeast Asia's tension between the developed and developing worlds. Bangkok also serves as a gateway to many other parts of Thailand. From here, you can hop a short flight to Phuket, Chiang Mai, Koh Samui, and other popular destinations. You can also board a train or hop on a bus for little money, and visit national treasures such as Ayutthaya, Lopburi, and many other gems of the country. If you only visit one major historical tourist attraction in Bangkok, this should be the one. The royal compound lives up to its name, with spectacular structures that would put the most decadent modern monarchs to shame. It's also the home of Wat Phra Kaeo, which houses the Jade (or Emerald) Buddha. Built in 1782, the grand palace was the royal residence for generations and is still used for important ceremonies and accommodating heads of state. Dress modestly when visiting the Grand Palace, which basically means covering your arms and legs and avoiding any sloppy attire. To avoid any hassle and to make the most of your visit, take the Grand Palace and Wat Phra Kaew Tour. This is a half-day sightseeing tour, either morning or afternoon, with pick up from your hotel and a local guide to put what you are seeing in context. Without a guide, it's easy to miss important features or not fully understand the relevance of what you are seeing, and the hotel pick up makes the whole experience that much simpler. Located immediately south of the Grand Palace precinct, Wat Pho makes an excellent addition to your tour, provided your feet are up for more walking. Also known as or Wat Chetuphon), the temple was built by King Rama I and is the oldest and in Bangkok. It has long been considered a place of healing, and was famous centuries ago for its pharmacy and as Thailand's first "university," both established by King Rama III. You can get a Thai or foot massage at the traditional medical school on the premises, but the prices are significantly higher than what you will find at massage parlors elsewhere in the city. Today Wat Pho is best known for the Temple of the Reclining Buddha, where you'll find a statue so big (45 m long and 15 m high), it cannot be viewed in its entirety only appreciated in sections. The soles of the feet, inlaid with a myriad of precious stones, are particularly interesting with the 108 signs of true faith. Also look for the long earlobes signifying noble birth, and the lotus-bud configuration of the hand to symbolize purity and beauty. Wat Arun is something of a triumphant complex, dating back to ancient battles between the former Siam and Burma. 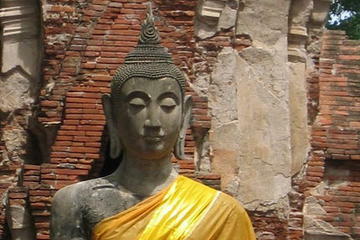 Having fallen to the Burmese, Ayutthaya was reduced to rubble and ashes. But General Taksin and the remaining survivors vowed to march "until the sun rose again" and to build a temple there. 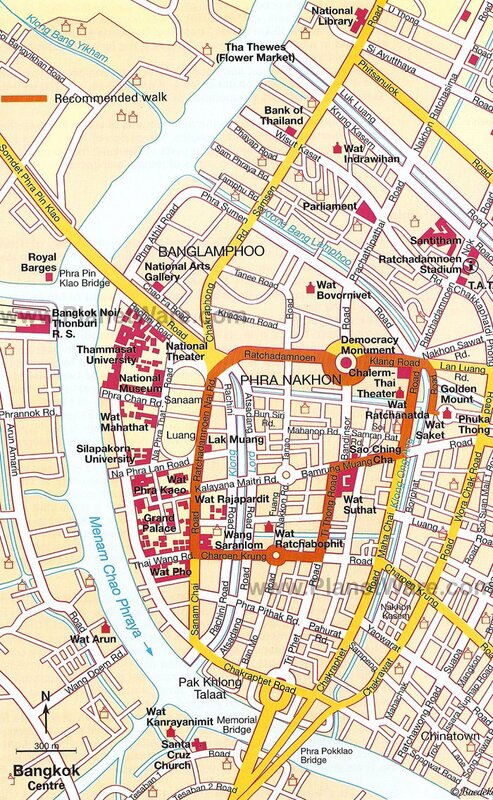 Wat Arun, the Temple of the Dawn, was that temple. It is where the new king later built his royal palace and a private chapel. If you climb to the top of the prang just before sunset, you are rewarded with an unforgettable view as the sun sinks over the Chao Praya River. Even if you don't plan to be doing any climbing, sunset is really the time to take in this place in all its glory. Sheer luck (or lack thereof) makes this attraction special. During the 1950s, the East Asiatic Company purchased the land around the temple. A condition of the sale was the removal of a plaster statue of Buddha, but the statue proved too heavy for the crane being used. The cable parted and the figure was dropped, being left overnight where it fell. It happened to be in the rainy season, and when next morning some monks walked past, they noticed a glint of gold shining through the plaster. The coating was removed, revealing a 3.5 m Buddha cast from 5.5 tons of solid gold. All attempts to trace the origin of this priceless statue have so far failed, but it is assumed to date from the Sukhothai period, when marauding invaders threatened the country and its treasures, and it became common practice to conceal valuable Buddha figures beneath a coating of plaster. No one knows how it came to Bangkok, but here it stands available for the admiration of visitors from all over the world. Wat Suthat, adjacent to the Great Swing, is one of the oldest and most beautiful of Bangkok's Buddhist temples. Three kings had a hand in its construction: it was begun soon after the coronation of Rama I (founder of the Chakri dynasty) in 1782, continued by Rama II, and completed ten years later by Rama III. Apart from its delightful architecture, the temple boasts some exceptionally interesting wall paintings. Wat Suthat is less popular than some of the other temple complexes in the city, so you'll enjoy a more peaceful and intimate experience here. History buffs in particular will want to devote at least half a sightseeing day to the national museum, if not more. Until the mid-1970s, this was Thailand's only museum, which explains why its collection is so big. Fortunately, just about every exhibit is labeled in Thai and English and guided tours are also offered in English, so you won't miss out on any of the country's fascinating ancient and contemporary history. The old Wang Na Palace built by Rama I remains essentially as it was, and stands as a testament to Thai history. Visitors can see regalia, religious and ceremonial artifacts, ceramics, games, weaponry, musical instruments and the Viceroy's throne, as well as an impressive collection of Buddha figures arranged according to period. Bangkok's sprawling weekend market is the largest in the world. Here shoppers find everything from jewelry and religious icons to animals and delicious street foods. There are 15,000 stalls, offering just about anything you can dream up. This is a great place to mingle with locals and immerse yourself in everyday Thai life, so arrive early and clear your schedule for the rest of the day if you want to do this place justice. For an even more interesting market experience, you can arrange a tour to Damnoen Saduak, a famous floating market located in Ratchaburi (about 1.5 hours outside Bangkok). 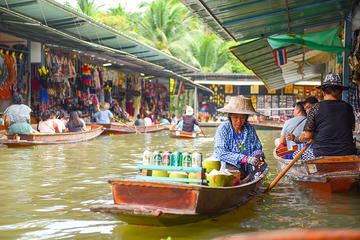 The popularity of floating markets once earned Bangkok the nickname "Venice of the East", bear in mind that this has now become something of a tourist trap, so don't expect an exclusive morning of shopping by boat. But you will be able to buy fresh and delicious foods and interact with locals in an authentic way. The best tour option is a Floating Markets Cruise Day Trip from Bangkok, which takes about six hours and includes pick up right from your hotel and offers transport in an air-conditioned coach. This tour guarantees the lowest price. This is Bangkok's infamous backpacker district, a neighborhood jam-packed with guesthouses, food vendors, clothing stalls, and travelers from every corner of the globe. You'll need to tap into your patience when hanging out here because, while it is colorful and exciting in its own way, the crowds and scents and blaring music can test even the calmest soul. But it is a great place to pick up a few pairs of the baggy fisherman pants - the perennial staple of every backpacker's wardrobe when trekking through Thailand, browse the treasures in a used bookstore, and dig into some delicious Indian food from a neighborhood restaurant. The historic home of a "self-made American entrepreneur" who disappeared while traveling in Malaysia now stands as a relic of an older time in Bangkok. Jim Thompson settled in Thailand after spending time there as a serviceman around the end of WWII. He was a prominent figure in the Thai silk industry and was awarded the Order of the White Elephant, a significant honor given to foreigners who have made contributions to Thailand. Thompson's home has been turned into a museum offering insights into his life and business, as well as the history of the city and the Thai silk industry. Lumpini Park provides visitors with a green oasis amidst the traffic and chaos of Bangkok. Hang out on one of several lawn areas, enjoy the shade of a Chinese pagoda, or take a boat out on the lake. Lumpini Park is a great place to spend an afternoon enjoying the contrast of the tranquil park with the skyscrapers rising all around it. Note that the park has been the site of anti-government protests that have occasionally turned violent in the past, so be sure to check on the current status before visiting. The name might lead you to think this is a transport hub, but it's actually a shopping mall. And you might be wondering why you would want to visit a shopping mall for kick while traveling. Well, Terminal 21 has a special flair - even by Thailand's shopping standards. Every floor of the mall has been themed to a different international city. Enter at the level of the BTS station and you'll be in Paris; go up a floor and it's Tokyo; another floor and you're staring at the iconic red phone booths of London. The Caribbean, San Francisco, and Istanbul also figure into the design theme. Other malls of note include the high-end Siam Paragon, and adjacent Siam Discovery, which has more moderately priced chains and fun cafes (including one decorated entirely with teddy bears and toy soldiers). In order to experience Bangkok, you have to try to the cuisine. You'll have no trouble at all finding vendors to tempt you with treats, and you haven't really done the city without chowing down on grilled meats and fish, soups, fresh fruit, and myriad other dishes. This is a quintessential Thailand experience, tucking into a delicious (if mysterious) meal, surrounded by the chaos and heat of the city. Bangkok is a big city with many areas where visitors can stay and still have good access to sightseeing, shopping, and dining. Many of the top-end hotels are in the historic Riverside area. Not far away, budget-minded travelers and backpackers often frequent the Khao San area, around Khao San Road, which lies in close proximity to some of the major sites, including the Grand Palace, Wat Phra, Wat Pho, and museums. Sukhumvit is a more modern area with good shopping and easy access to other parts of the city on the Skytrain. This is a good place to find mid-range hotels. Below are some popular hotels in these key areas. Luxury Hotels: One of the best hotels in Bangkok is the ultra-posh Mandarin Oriental in Riverside, with a great location, beautiful pools, and several restaurants, including the Riverside Terrace overlooking the Chao Phraya River. Also in Riverside and more reasonably priced is the Chatrium Hotel Riverside, overlooking the river. This hotel has a beautiful infinity pool and several restaurants. For luxury accommodation in Sukhumvit, the popular boutique hotel, Ariyasomvilla, is a good choice, with a variety of room styles, all tastefully decorated. This is a modern hotel with old world charm in a tranquil setting with a lovely pool and grounds. Mid-Range Hotels: At the top-end of the mid-range is the Sofitel So Bangkok, with great rooms and amenities in a decent location. The Park Plaza Bangkok Soi 18 is a modern hotel in Sukhumvit, known for being good value. Also popular is the Glow Pratunam, with a convenient location and decent prices. All of these hotels have pools. Budget Hotels: For location, it's hard to beat the Adamaz House, just a short walk off Khao San Road and close to some of the city's most important attractions. The hotel has basic but clean rooms. The Phranakorn-Nornlen is a very popular budget to mid-range hotel with a good location and a bed-and-breakfast feel. Located in Sukhumvit is the Smart Suites, with budget prices and quality rooms. Take a guided tour of the city. To spare yourself the trouble of bargaining for everything, trying to find a taxi that will actually take you where you want to go, rather than where they feel like taking you, and to know that you are not getting ripped off, a tour is the most practical option. It will also save you time. To see the most famous temples, including the reclining Buddha at Wat Pho, take a Private Guided Temples Tour. Take a day trip outside the city. Some of the area's most interesting sites and experiences are found just a short distance outside of Bangkok. Hop on an elephant and ride through the jungle, take an ox and cart trip through a rice field, and look for wildlife on a Khao Yai National Park and Elephant Ride Day Trip from Bangkok. Take a tour to the ancient capital of Siam, including a river cruise, to see the Ayutthaya Temples and sites along the Chao Phraya River on the Ayutthaya Temples and River Cruise Tour. This is one of the most popular day trips from Bangkok, with hotel pickup and drop off. Be prepared to bargain. This applies as much to taxi rides as market shopping, if not more so. Taxi drivers in Bangkok are notorious for overcharging, so agree on a price before getting in. Or, insist that they use a meter. Take advantage of public transportation. Even with an honest cabbie, rides can get expensive in Bangkok's traffic. Bangkok has a good public transportation system, with both above-ground and underground trains covering a good portion of the city. Buses can take awhile, prone as they are to getting stuck in said traffic, but the trains provide a quick, easy, and cheap way to get around. The system is user-friendly and takes little time to figure out, so take advantage of it while you're in town. Watch out for scams. As mentioned above, taxi drivers often try to overcharge or insist that their meters don't work. Use your judgment and walk away from anyone who doesn't seem trustworthy. There are plenty of cabs in Bangkok; you'll get the next one. Another scam to watch out for involves a driver or supposed tour guide who agrees to take you one place and starts making stops along the way, usually at a gem store. They get a commission when they bring in tourists, but these places are often overpriced and not worth visiting. Insist that the driver take you to original destination, or tell them you're leaving. This will usually get things back on track, but again if it doesn't, you'll find another cab quickly enough.